Now for the actual install. 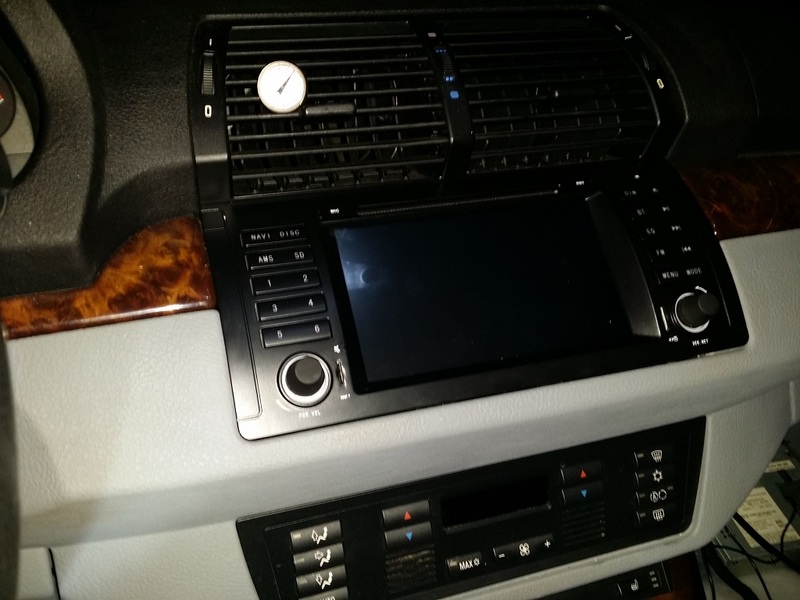 First you need to remove the factory head unit. 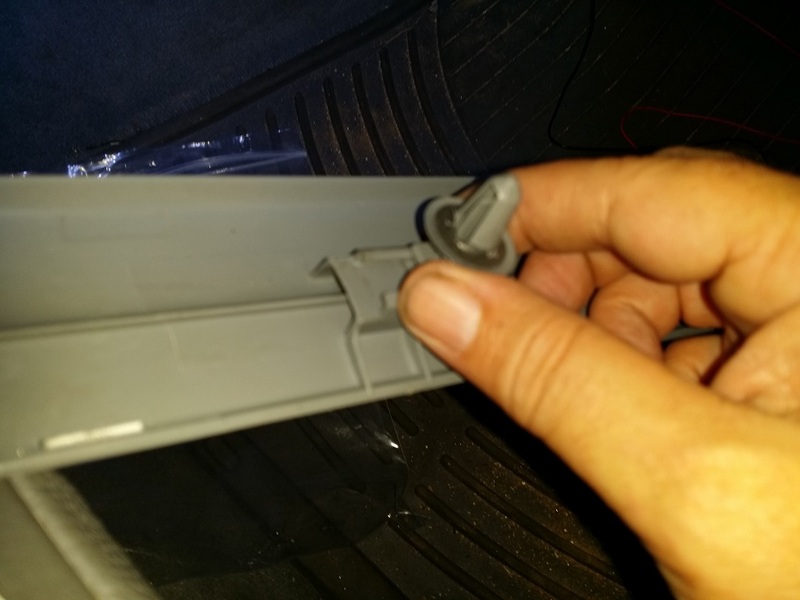 Using a plastic interior removal tool or something similar gently pry out the trim ring from around the head unit. I started beside the track forward aka to the right button area on mine. It gave the most and popped out nicely. Work your way around the ring and it will come off easy enough. Your left with this view. 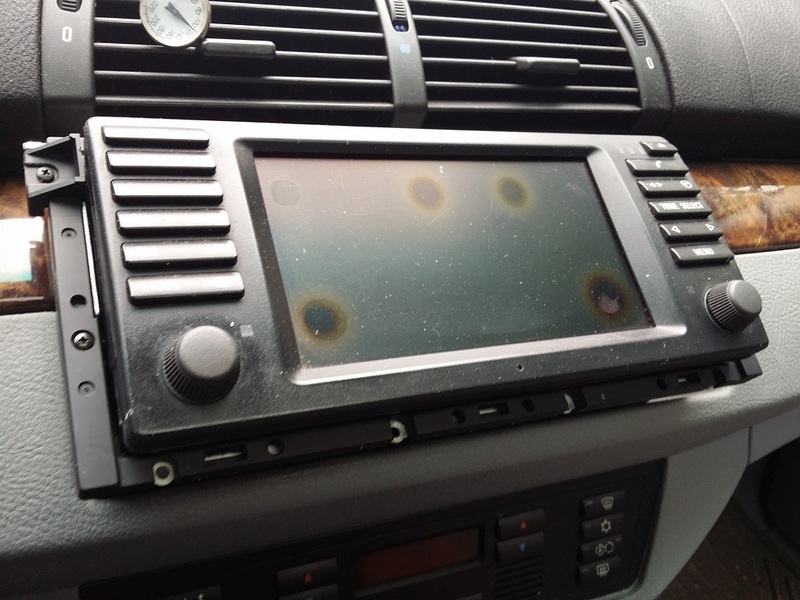 Now we need to remove the screws holding the head unit in. 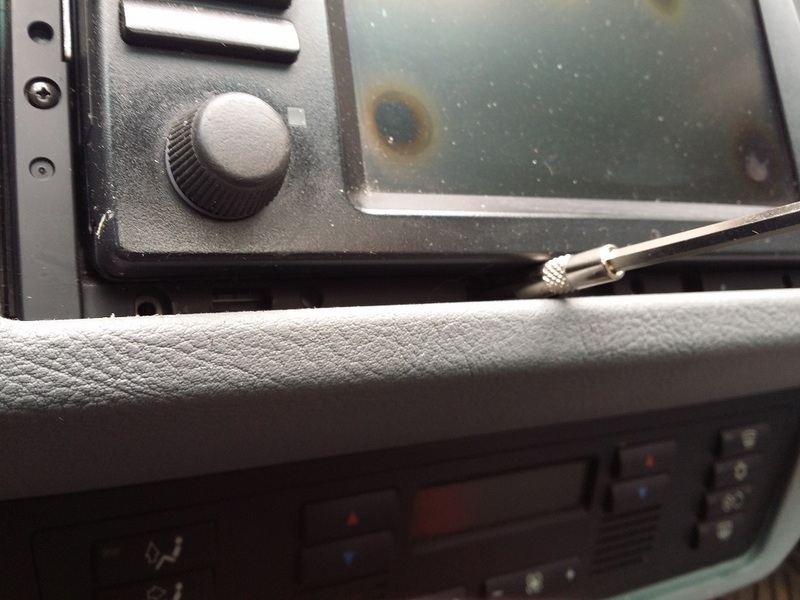 There are 4 screws holding the factory head unit in. Remove these. 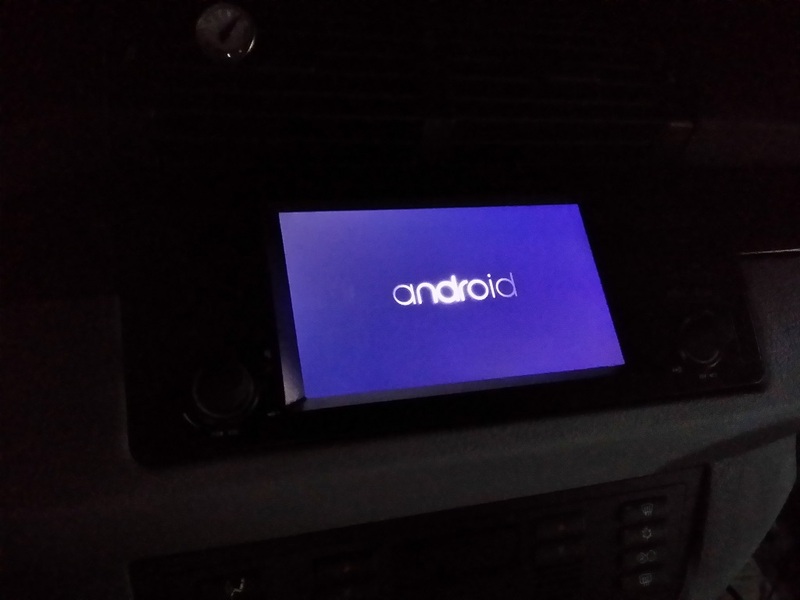 Now slide the head unit out. Next remove the two plugs from the bottom of the head unit. They are removed by rotating the handle from one side of the plug to the other. The pictures below show how they work. Don’t bother keeping up with these as we won’t be using them again. Just tuck them down in the dash out of the way. Your left with this view after it’s removed. Next we move to the hatch area at the back. Remove the carpeted cover that’s over the spare tire. Then remove the spare tire. Next remove the metal cross brace that was under the spare tire. I will post pics of this later. Next remove the plastic cover that was under the cross brace. 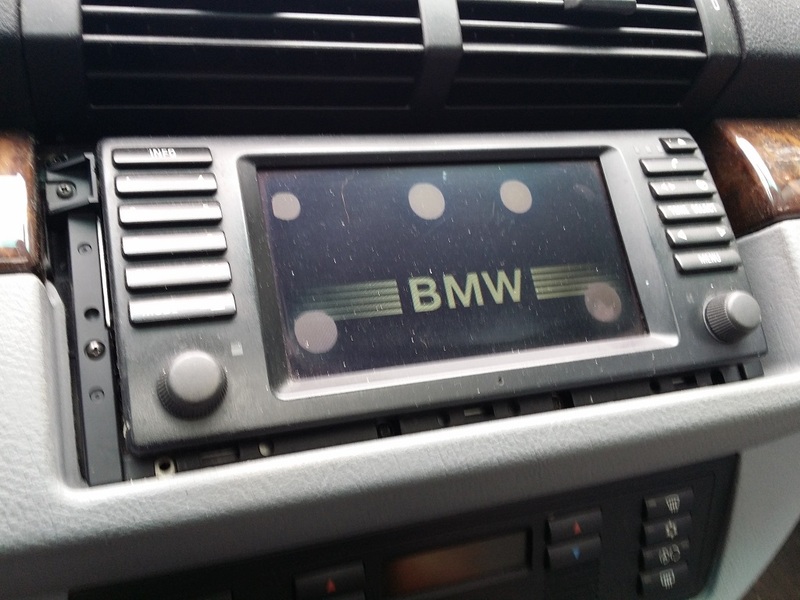 This exposes the factory radio unit and possibly other modules depending on what options your x5 has. This is the plug you removed from the radio module. 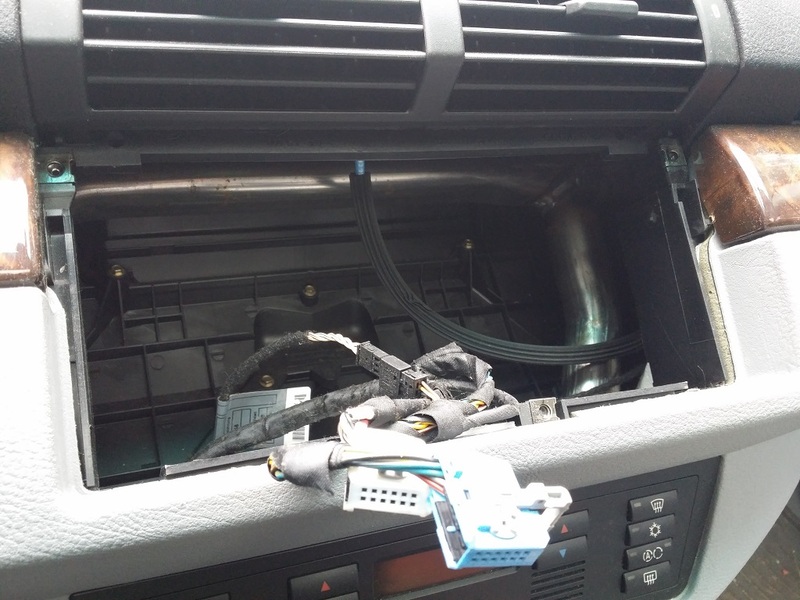 Now place that super long cable they sent with the radio in the hatch area so you can work with it. 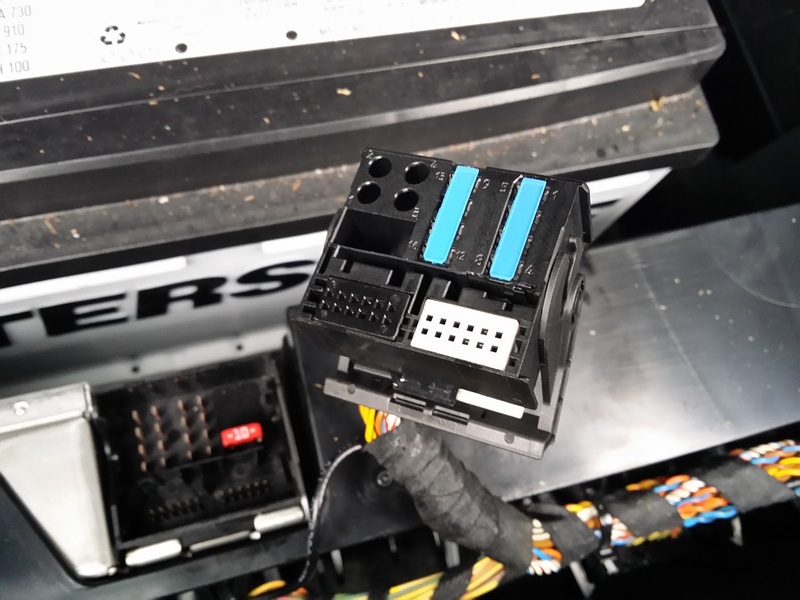 Also retrieve one of the two power connectors that are included. One has round pins which is used for non factory nav installs and the other is what you see here which is for factory nav installs. So make sure you have this end for this install and put the other up since we wont be using that other power cable. Both are labeled as power connectors. 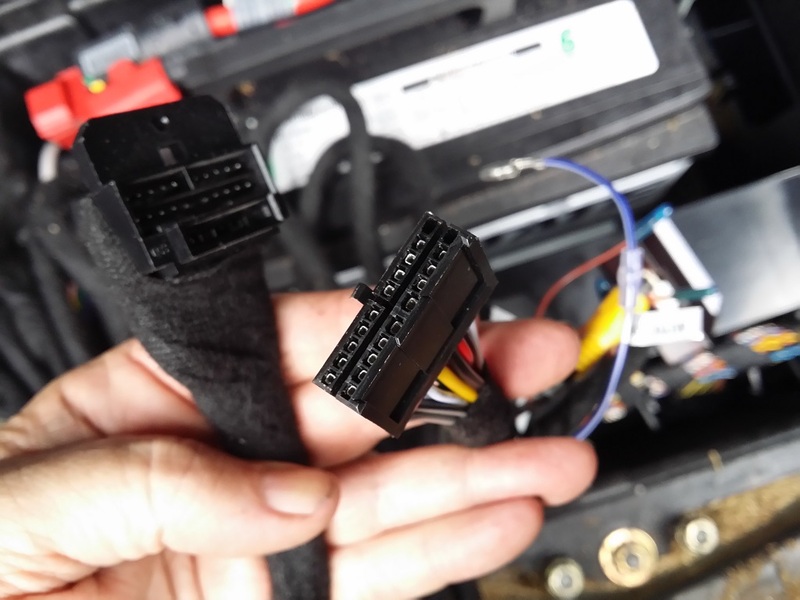 Next we need to plug these two connector together. Its not easy. 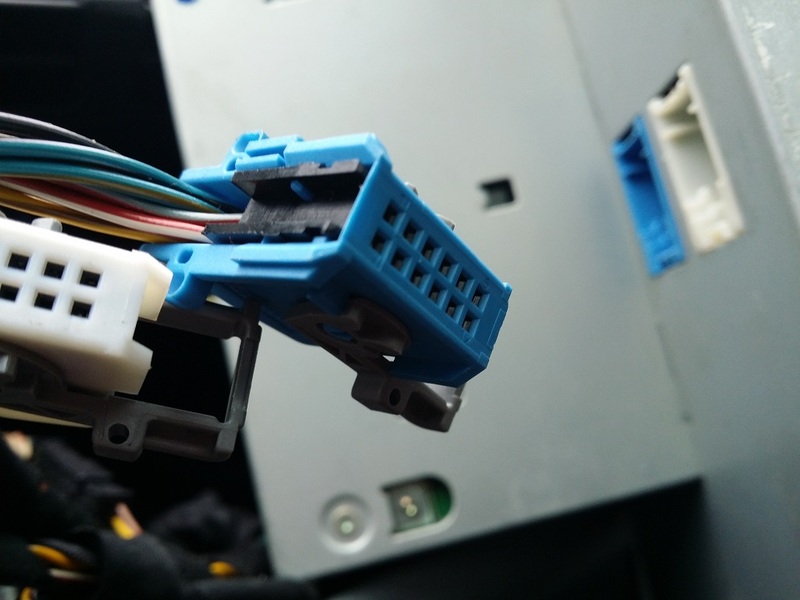 The included connector didn’t plug in as smooth as I am used to when dealing with bmw connectors but to be honest the thing wasn’t that smooth on the factory radio module either so go figure. Now pickup the long cable they sent. Notice that one end is female and one is male. 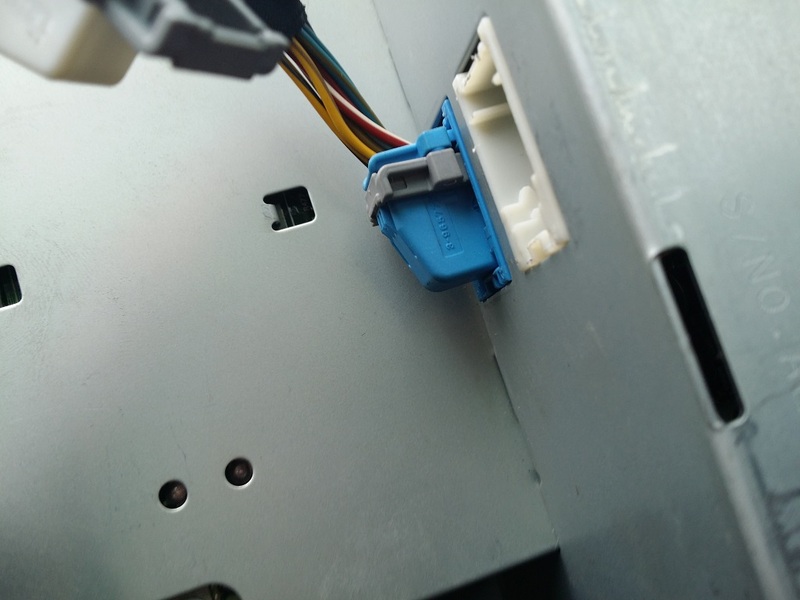 We are interest in the male connector aka the one with the 90 degree connector and the plastic tab at the top. Plug the male connector into the connection on the cable piece we plugged into the factory harness just now. Next I had to “fix” a problem my install had. The system would not power on the amplifier. 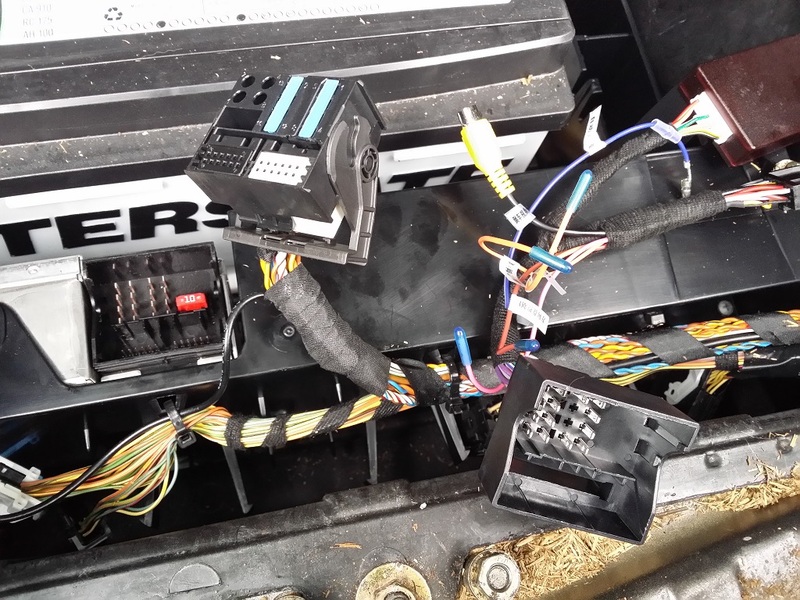 There was no power coming from the seicane head unit on the wire that should turn on the amp. 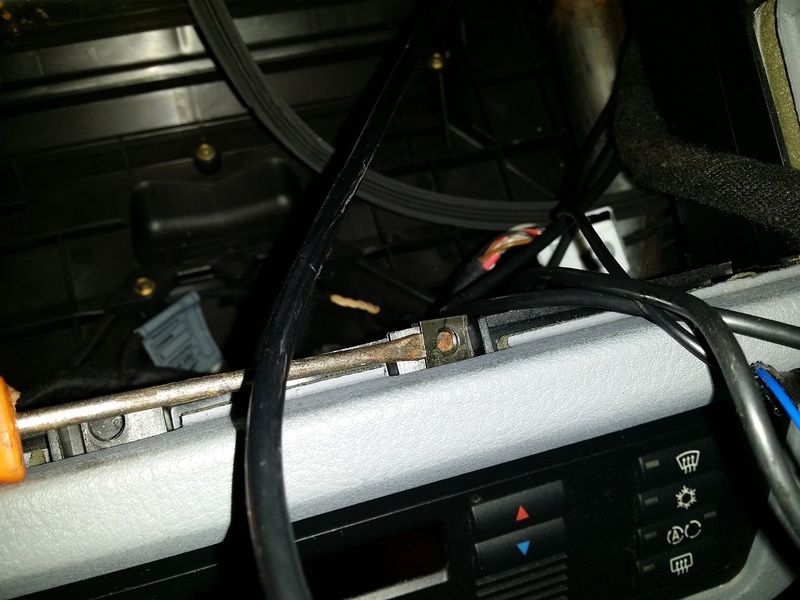 So I ran a wire from the seican head unit to the hatch area and spliced it into the plug they provided. This powered the white wire in the factory harness to turn the amp on when the radio came on. I will post pics of this tomorrow. Its raining right now and I don’t want to get soaked taking pics tonight. 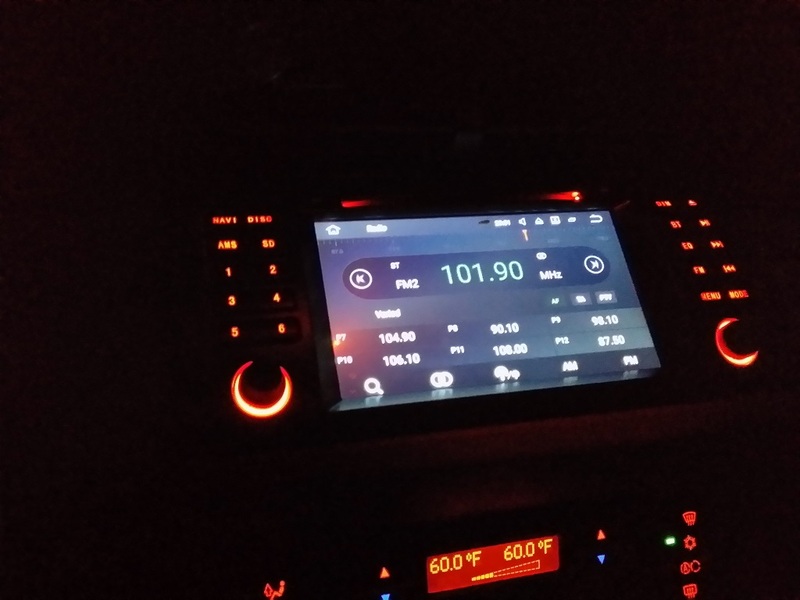 Here is a picture of the head units wires. 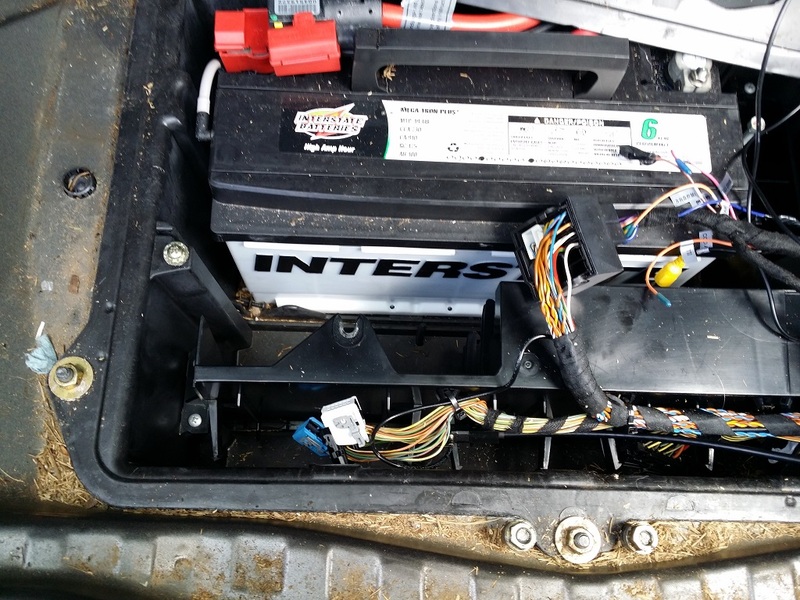 The wire I mentioned that you run from the head unit to back to solve the amp not powering on is hooked to #5 on the seicane head unit. Its blue with a white stripe I think. I know its blue just not sure on the white stripe part. Then the other end of the wire hooks to the “auto ant” wire in the hatch area. It is blue with a white stripe for sure. This will fix the amp problem. 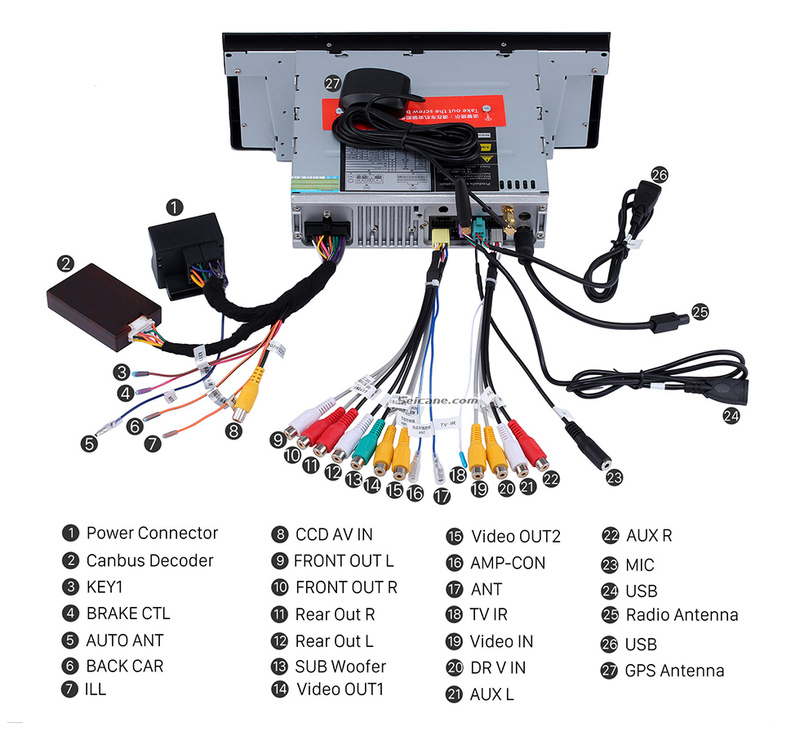 Ok this next part isn’t part of the proper install but in my opinion your a fool if you don’t do this…..
Run the long cable provided thru the middle of the interior to the seicane head unit. Yep right up the middle over the seats and all. The reason for doing this is to make sure everything is going to work. No sense in running the cable under the carpet and such only to have a dead radio. 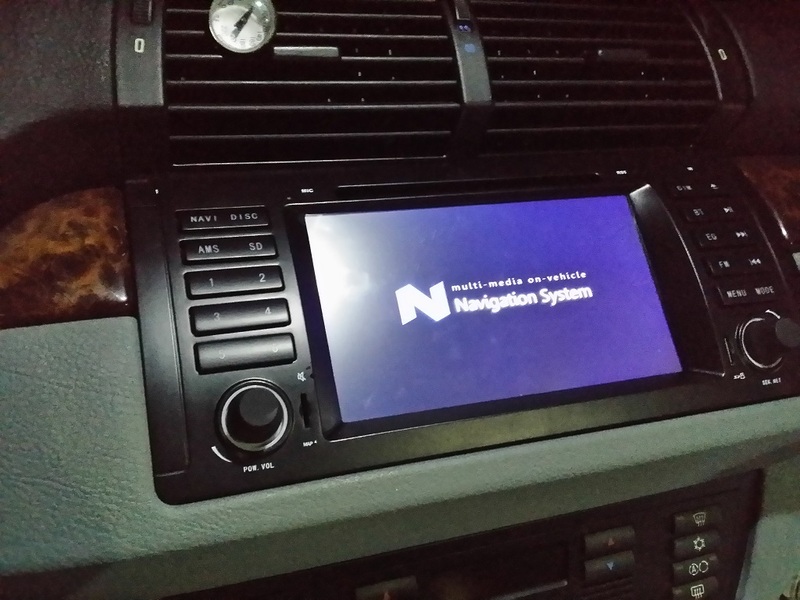 This way you can put the old system back to working almost instantly if something isn’t working right. Ok now we have verified its alive ! So we know we have a working radio. 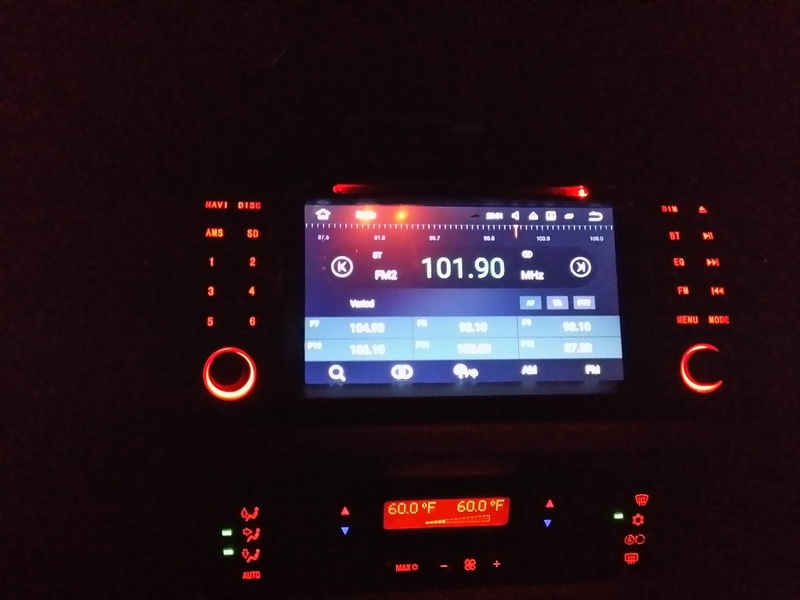 If you don’t have a working new radio at this stage you need to figure out why and not go any further. But if your good to go and its playing music then its time to add more toys. 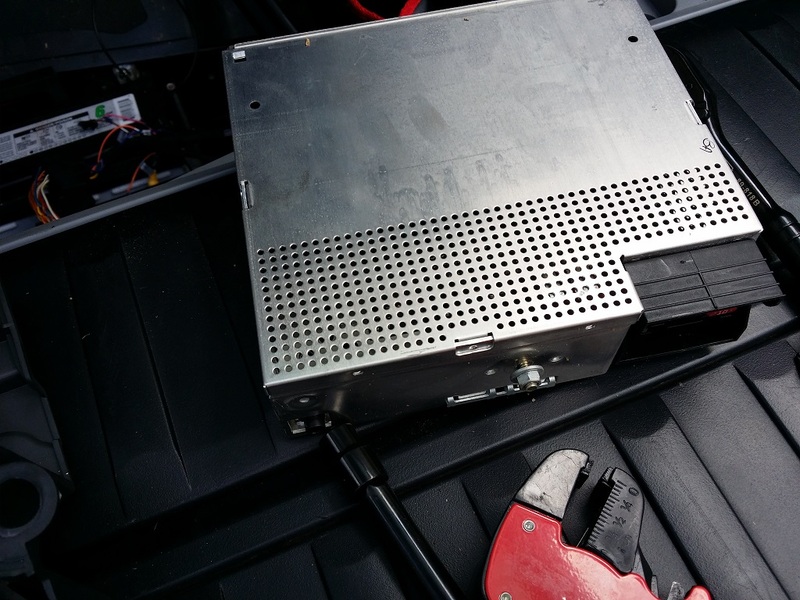 Next we need to get the backup camera wires, the tv module wires and the antenna wire into the dash so they come out behind the hole for the radio. Find the very loooong antenna included with the radio. Squeeze the antenna connector on the back of the factory radio module we unplugged that huge plug from earlier and pull it out. 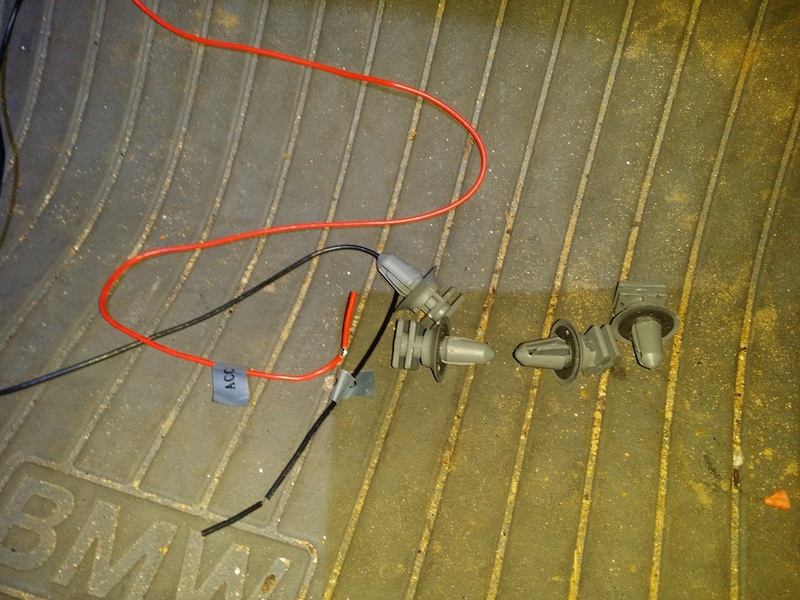 Now plug the factory antenna wire into the extension wire that came with the radio and run it up front. 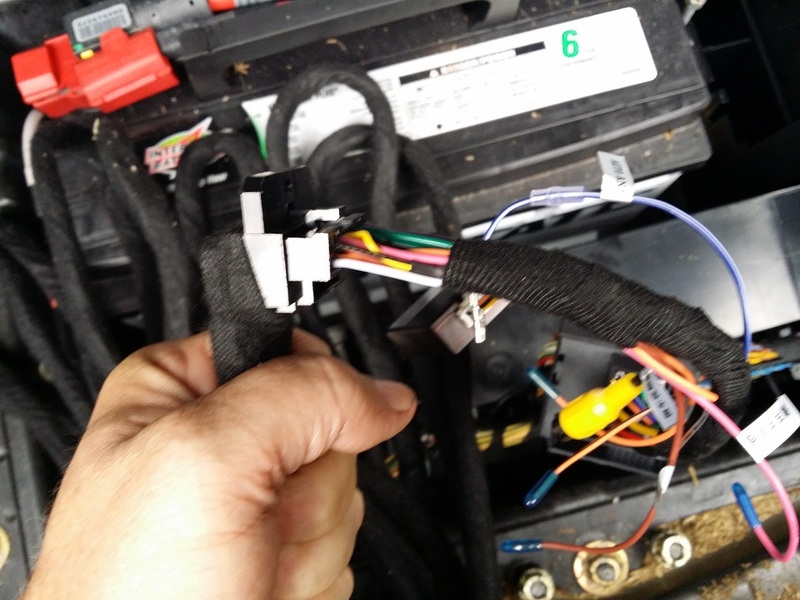 This for testing too since we will be undoing all of these wires from the rear hatch area when we run the wires correctly to hide them. Ok now we have the extension antenna wire, the back up camera wires and the tv module wires all up front for now along with the main radio cable wires. To get these thru the dash and out the hole the radio mounts in we need to tape the ends together but you need to stagger them some. If you just put all the ends at the end and tape them all together it will be so fat you won’t be able to thread it thru. Now lets get that mess into the dash. 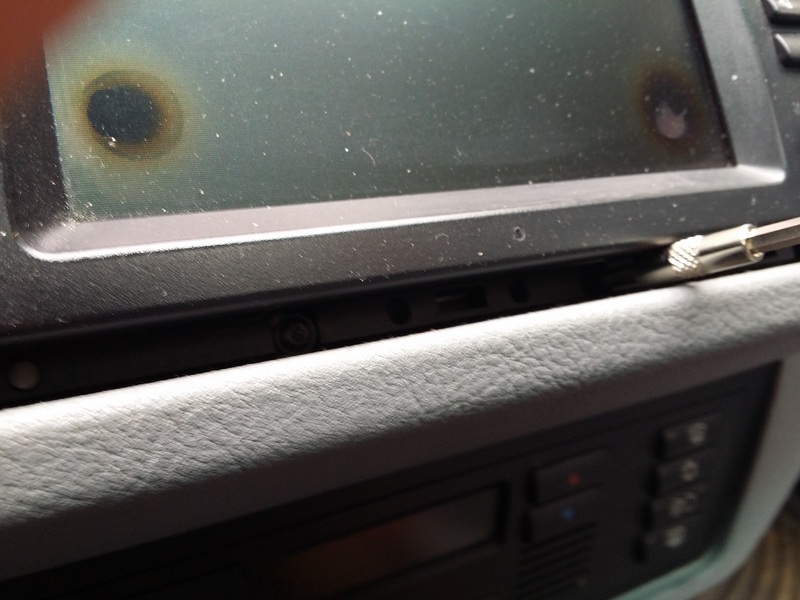 Look up under the dash on the passenger floorboard side and notice that there are two flat tabs sticking down. One on each side of the plastic cover under the dash. Turn each 1/2 turn and that will release the plastic cover. Pry it down on the side towards the door and you will have access to what we are after. 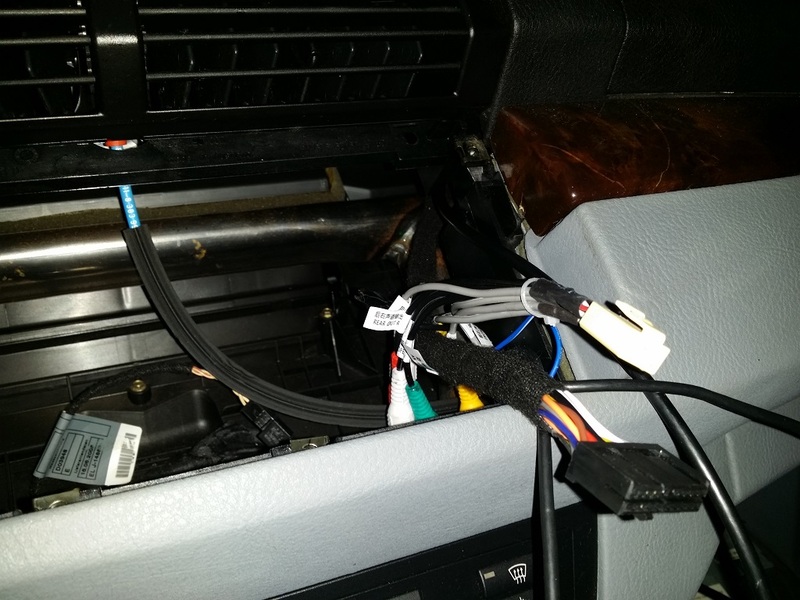 Now I used the gps antenna cable to snake these wires up because that brass fitting on the end of it had a nice weight to it to help it drop downward thru the mess in the dash and because it had a long cable. 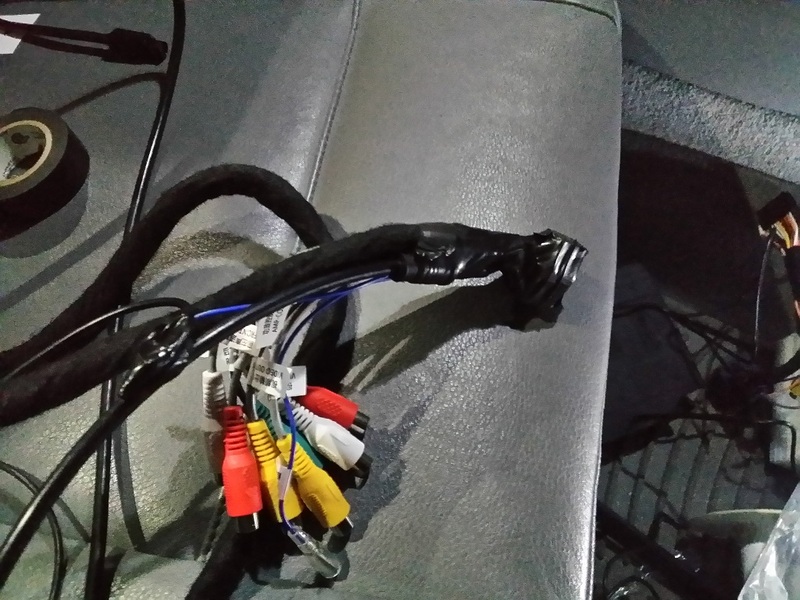 If you do this remember to not pull to hard on it when snaking the cables up thru the dash. 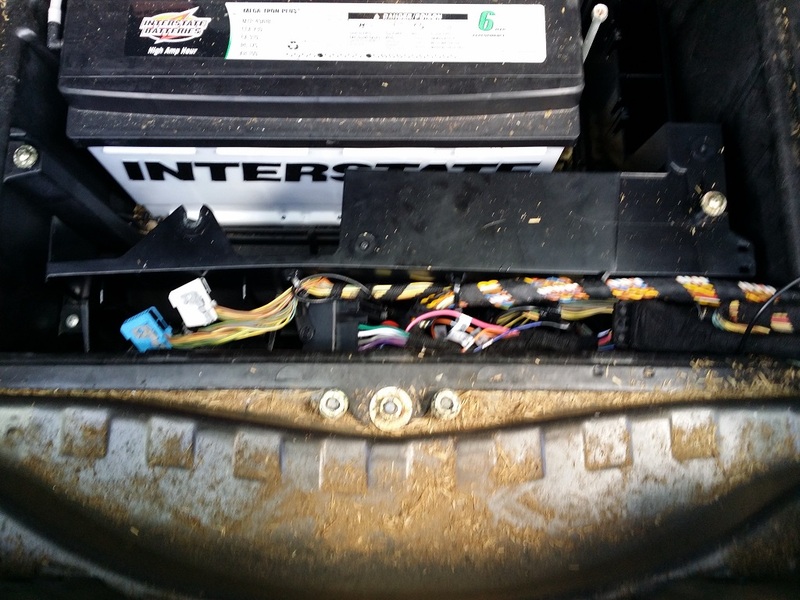 Feed the wires in under the dash while pulling on the gps antenna wire. Its all I had but worked great. Again its not a strong cable so be careful with it. Here is what it should look like when done. 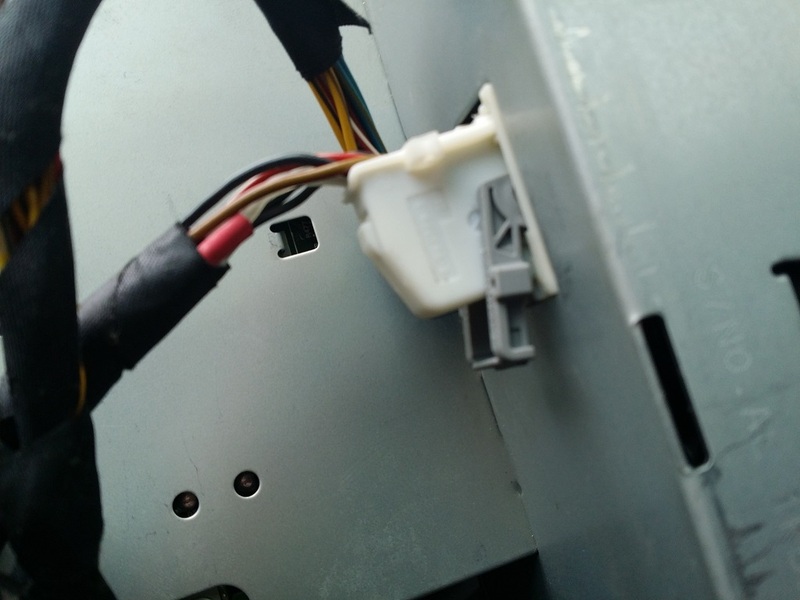 Next we need to remove the two metal clips from the bottom lip where the bottom screws were for the factory head unit. 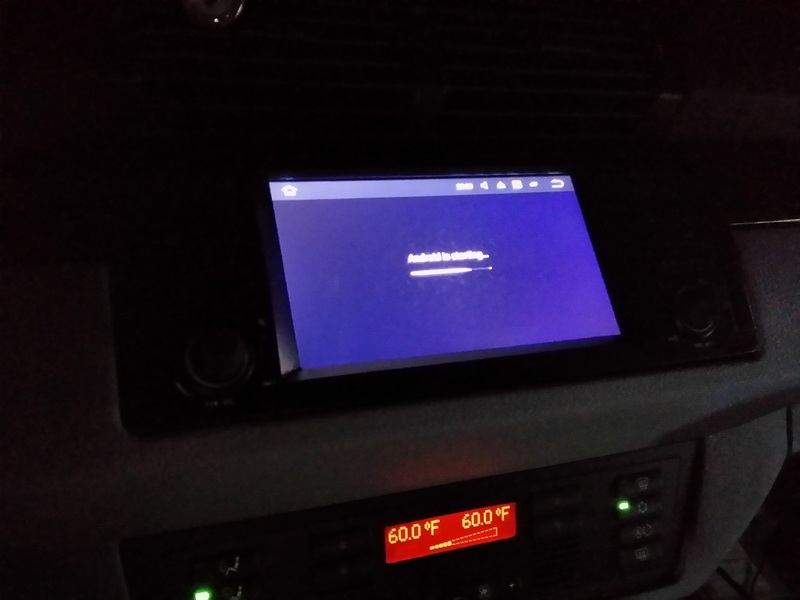 The radio kept catching on these when I tried to install it. Lift them up a bit with a flat head screw driver and they slide off easily enough. 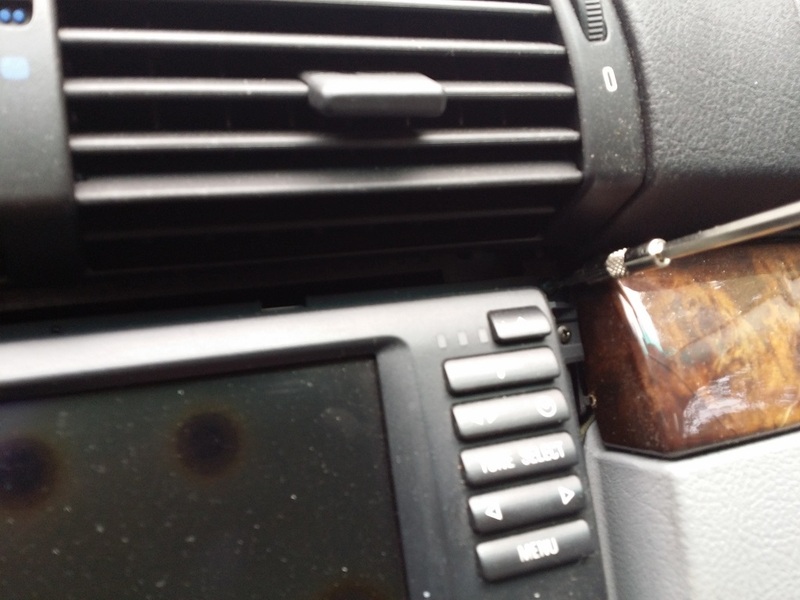 Now place the gps antenna on the large metal bar that runs across the inside of the dash. I may move it later but I stuck it to the top of the bar for now. 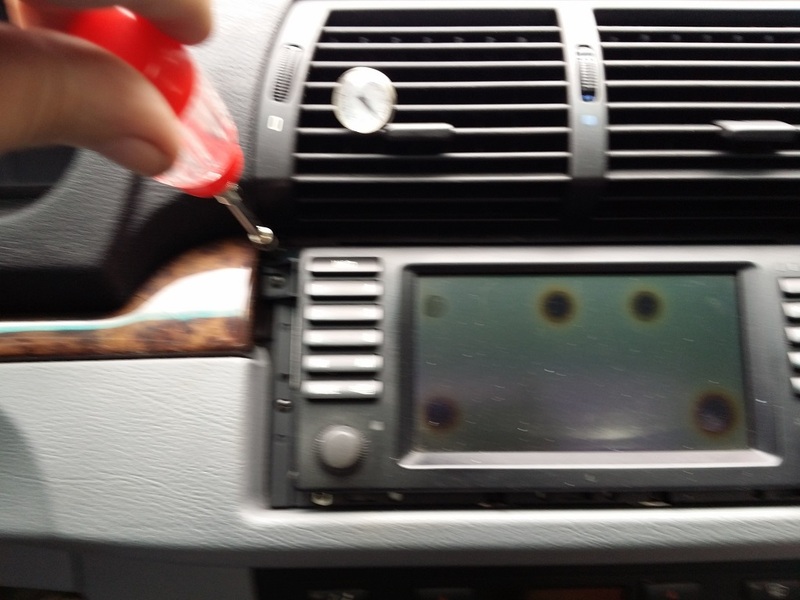 Then slide the radio into the hole and put the two screws in the top. One on each side. This is as far as I got before the rain started pouring. Now we need to run the harness from the front to the back “correctly” as we just have it run temporary to test the radio up till now. Please excuse the dirt in these pics. I normally keep the X5 vacuumed out and its so dirty during this because it had been pouring rain and I wanted to get the install done. Mud was being tracked in like crazy during this. That’s said lets run that cable. 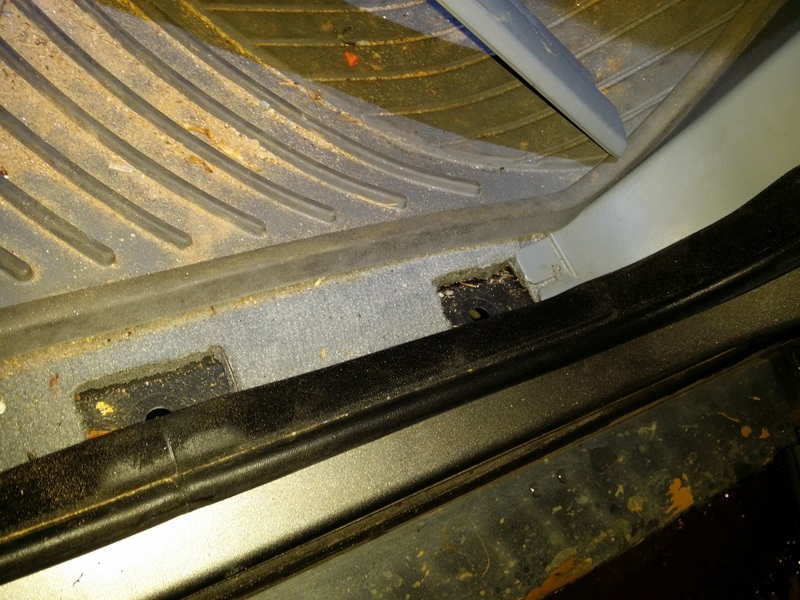 Remove the passenger side door sill trim by prying it up. It will look like this when removed. Be careful to keep up with these clips. They like to come off at the least effort and will get lost if your not careful when your removing the sill trim. Now remove the felt trim that runs along the lip that was under the plastic trim panel you removed earlier. This just lifts up and will make the carpet difficult to deal with when running the cables thru. 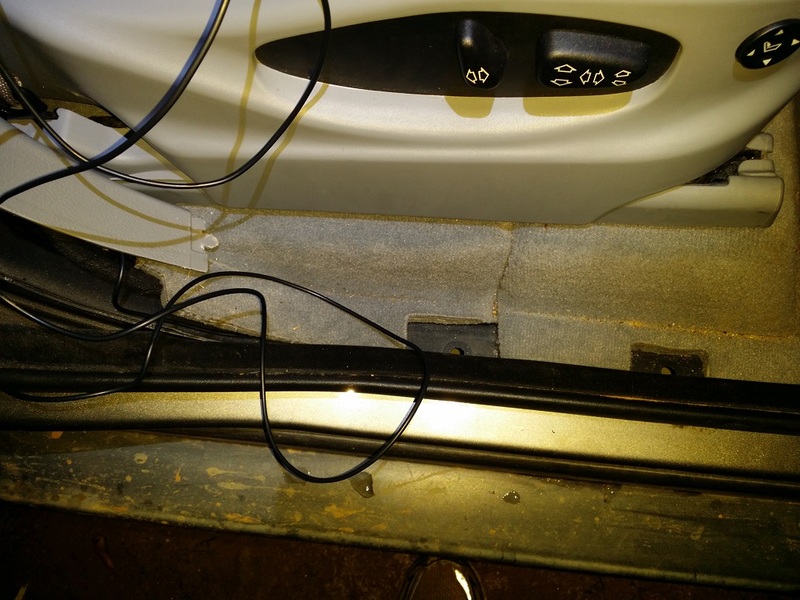 Now route the cable you have from the head unit under the carpet along the floor at the doors to the back seat. Make sure you get the cable up under the carpet far enough to not cause a lump at the edge of the carpet or you wont be able to get the door sills back in place. 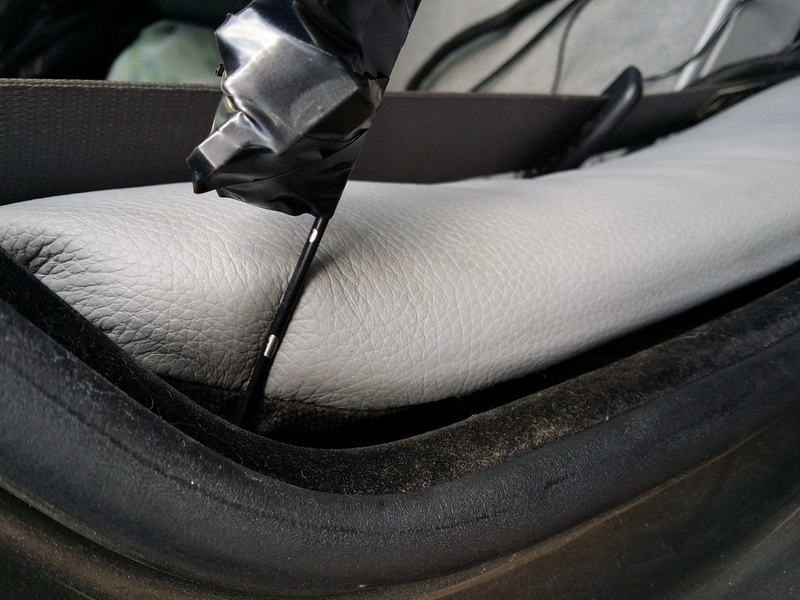 Once you have the cable run under the carpet to the back seat area things get tricky. 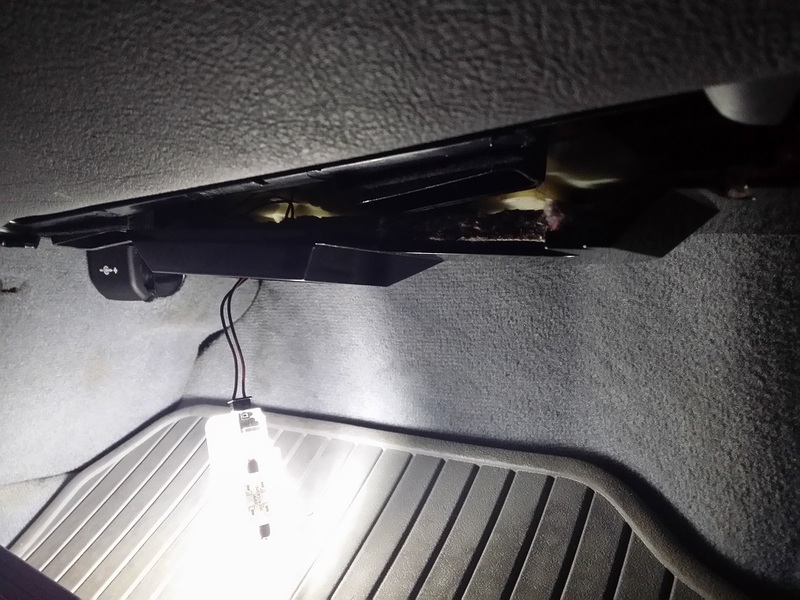 I couldn’t get the cable to snake thru the gap at the side of the seat to get it to the fuse box area in the back cargo area. The cable kept turning and running anywhere but where I needed it to go. My solution was a bit unorthodox but it worked great. 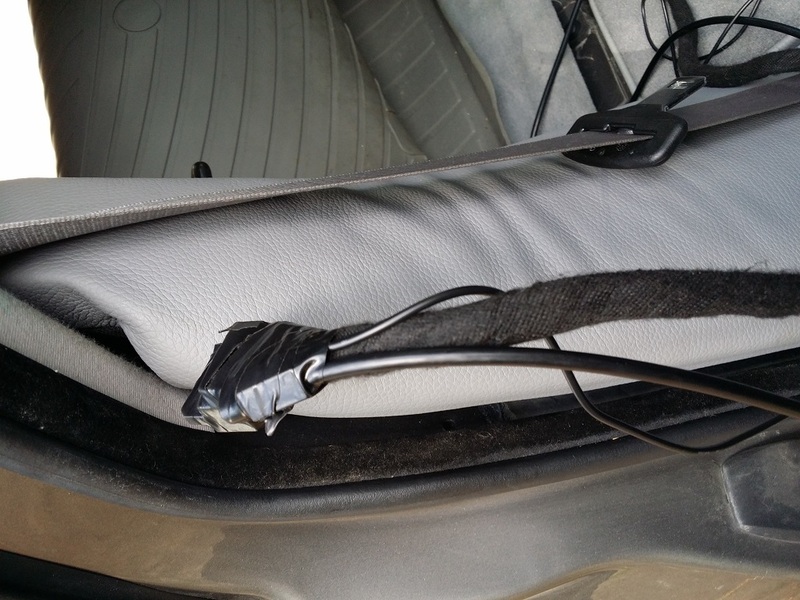 I removed the fm radio antenna off my F150 pickup and taped it to the end of the cable I needed to run. 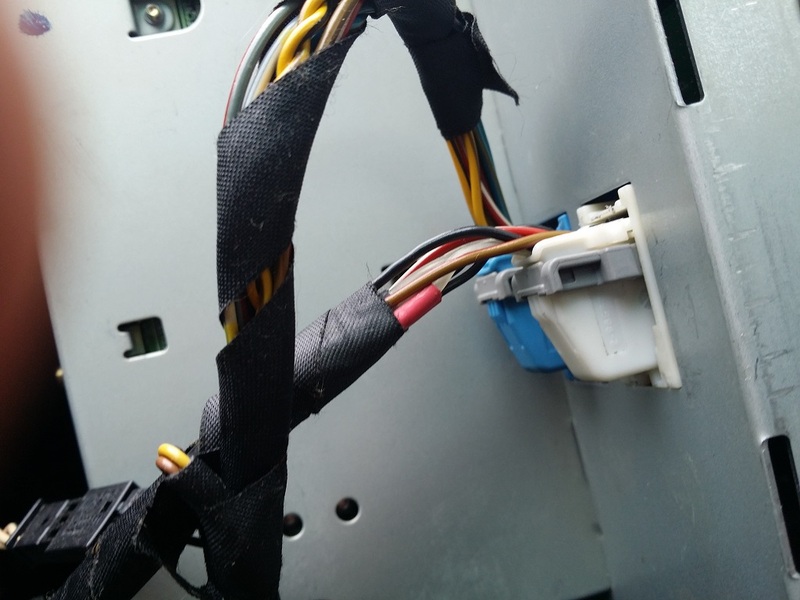 If you use something like this to run your cable then this is how it goes. First tape the cable ends together so they will go thru easily. 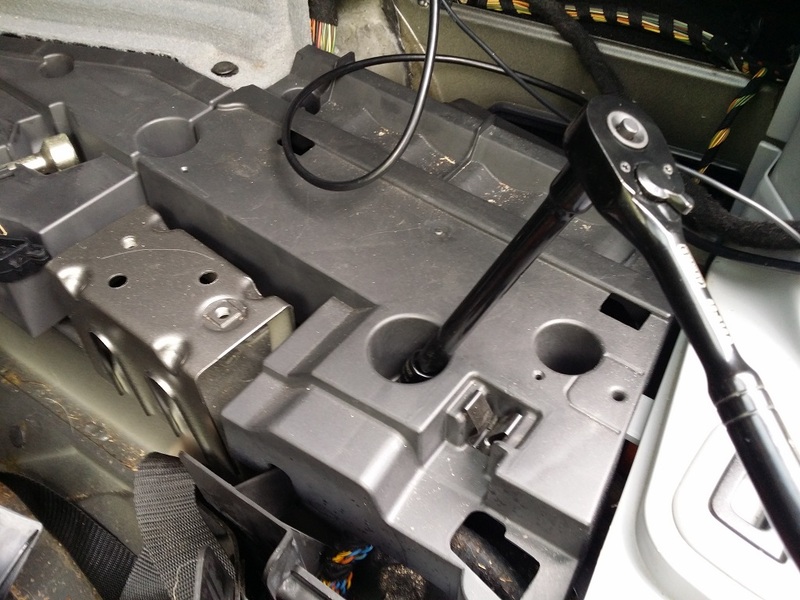 Now run the antenna from the rear fuse box compartment to the rear seat area like this. Now tape the cable end to the end of the antenna. 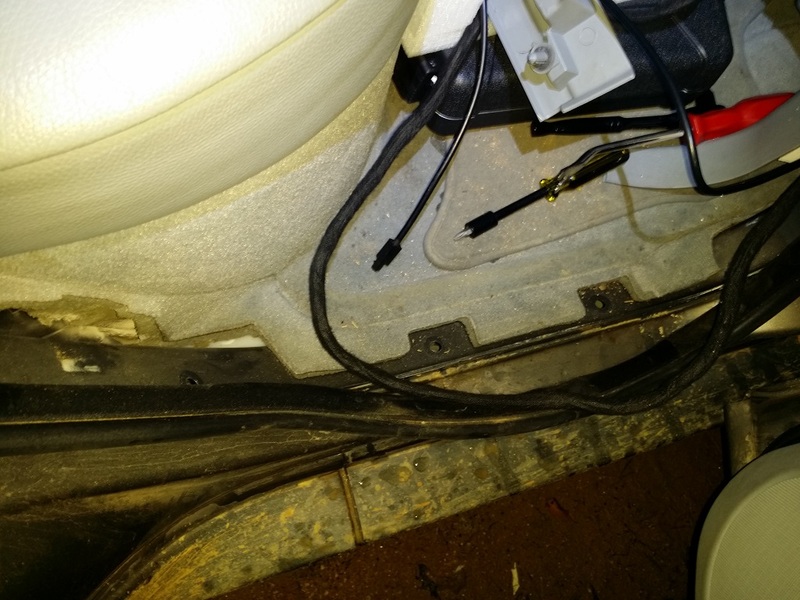 At this point you simply pull the antenna mast back out the rear of the vehicle and it will bring the cables along with it. Next remove the carpeted cover that is the hatch floorboard. 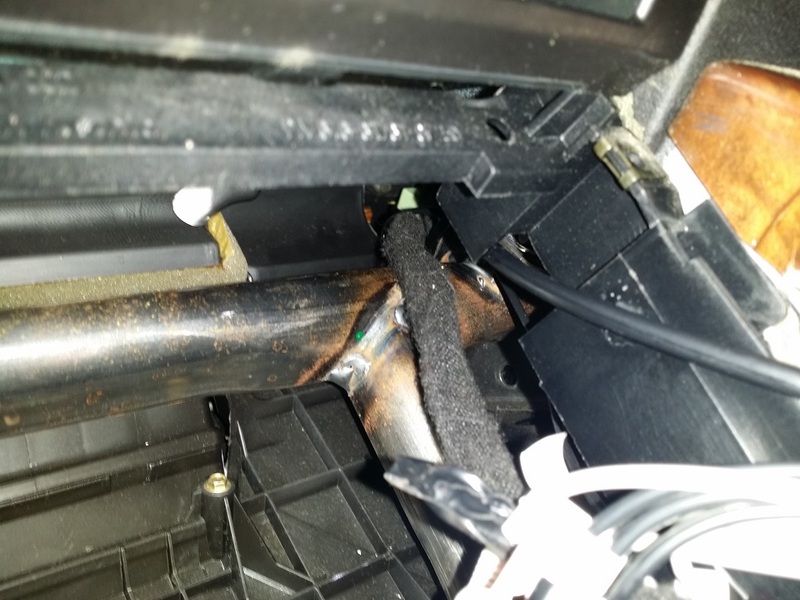 The part that hides your spare tire. 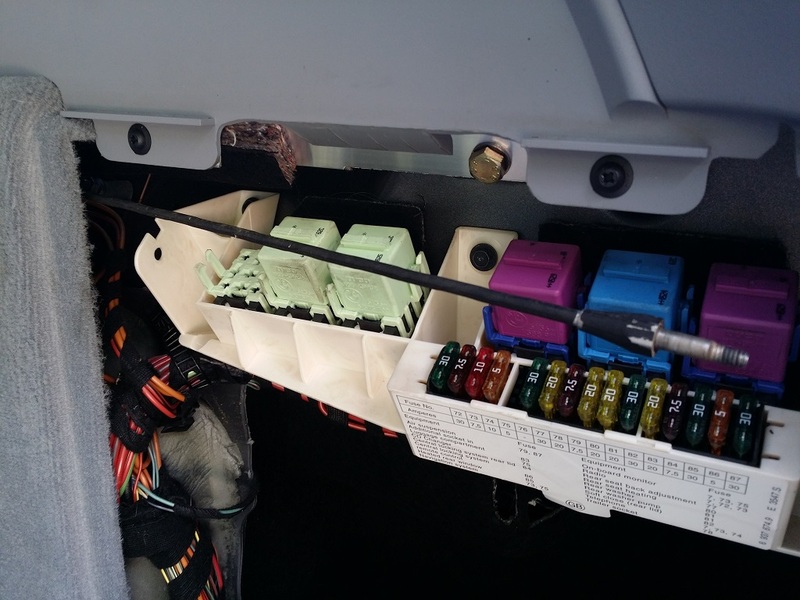 Now remove the plastic cover in front of the fuse compartment like this. 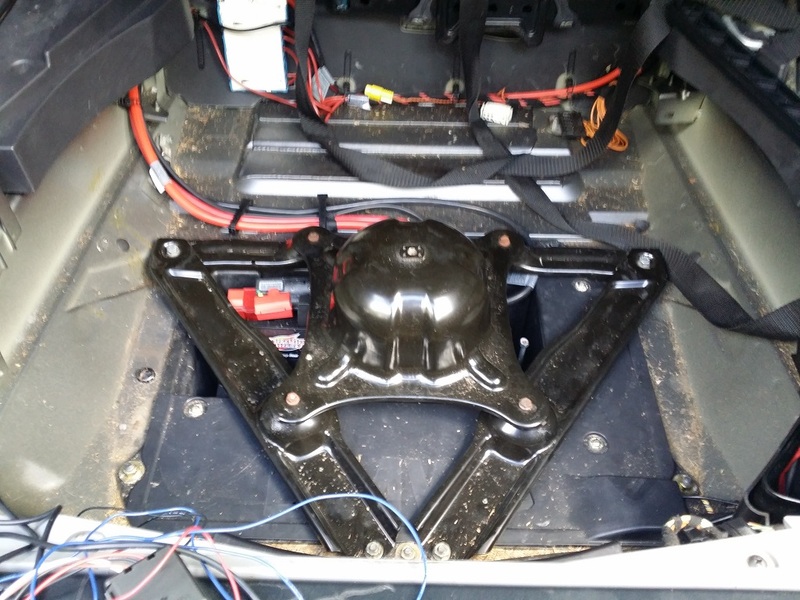 Now remove your spare tire and the X brace that’s under it which looks like this. 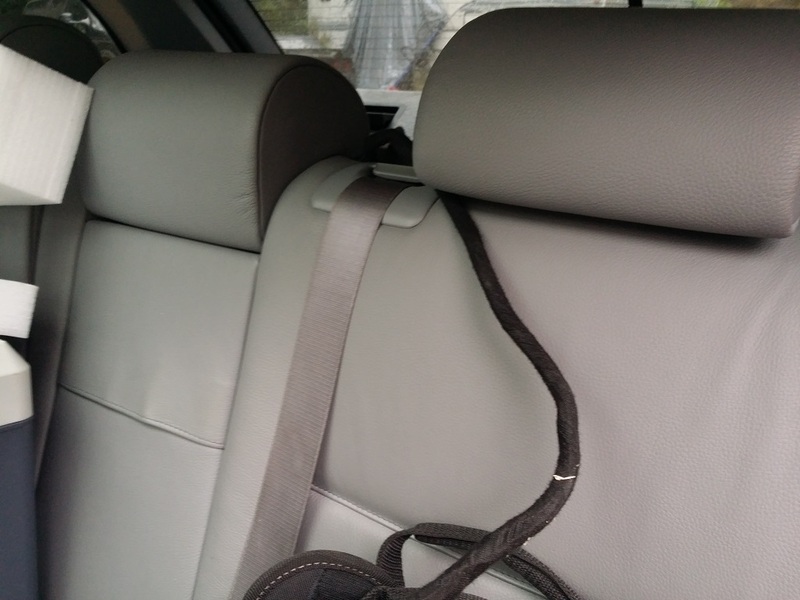 Then remove the plastic cover that was under the metal x brace. Once the cover is out of the way you can remove the factory radio module. Its not required but I didn’t want the extra weight back there for something I wasn’t going to be using. So this part is up to you. The module looks like this when removed. 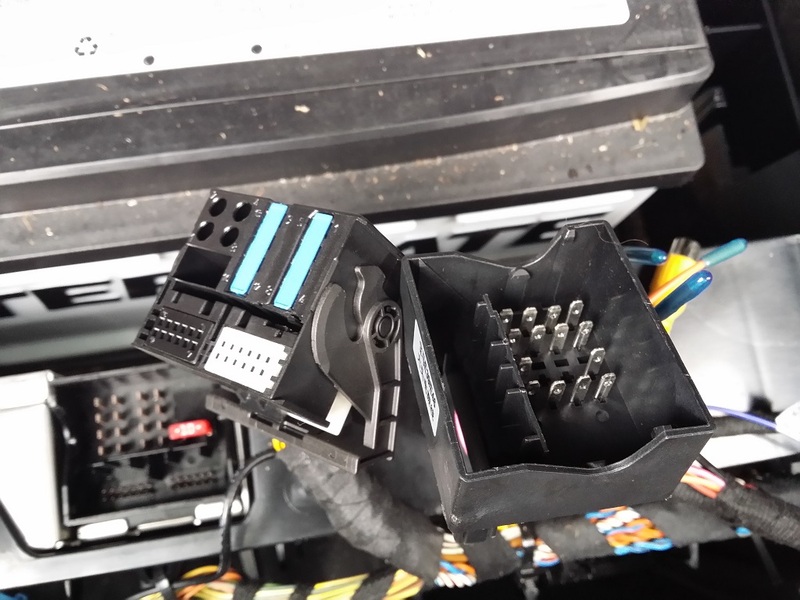 Now plug the new head unit’s harness we ran from the front into the connector that was plugged into the factory radio module just like we did earlier when we were testing the head unit out to see if it worked. Like this. Next we need to hide the wires back down like they were from the factory. Which should look like this. Minus all the hay straw. I have no CLUE where that came from I guess the previous owner hauled straw? 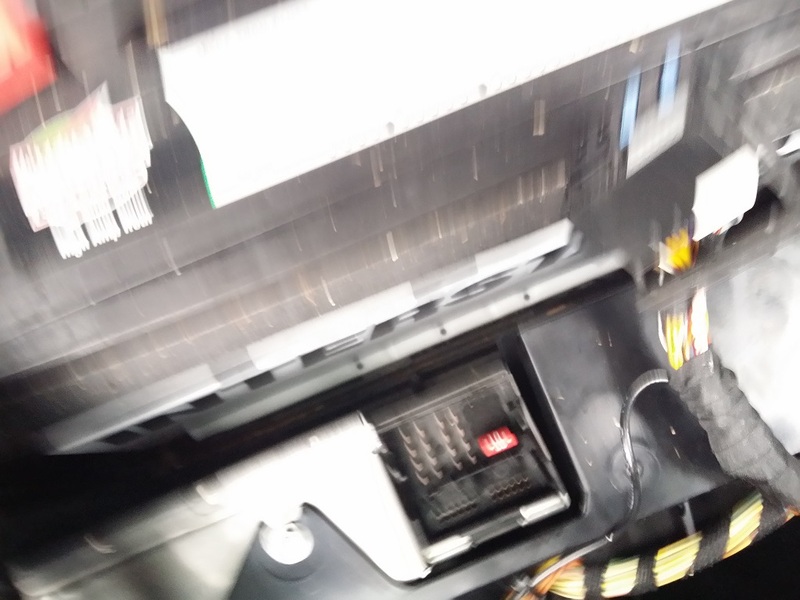 Once that’s done reinstall the plastic cover that’s in front of the fuse compartment and tape the harness you ran along the factory wires leading down thru here like this. Its just a matter of reinstalling what you removed now. Put the cover back over the battery area. Then install the X brace and then put the spare tire back in place. 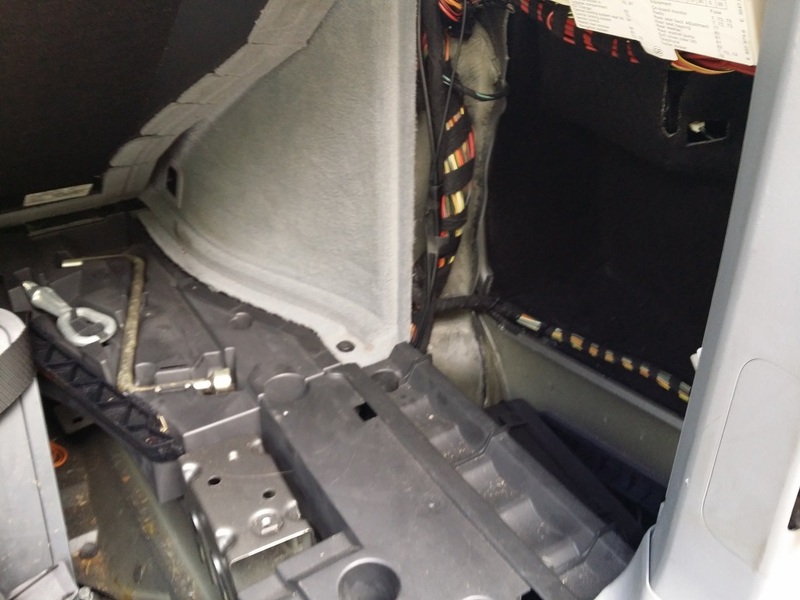 Next put the carpeted cover back in the floor of the hatch area and put the fuse door back in place. 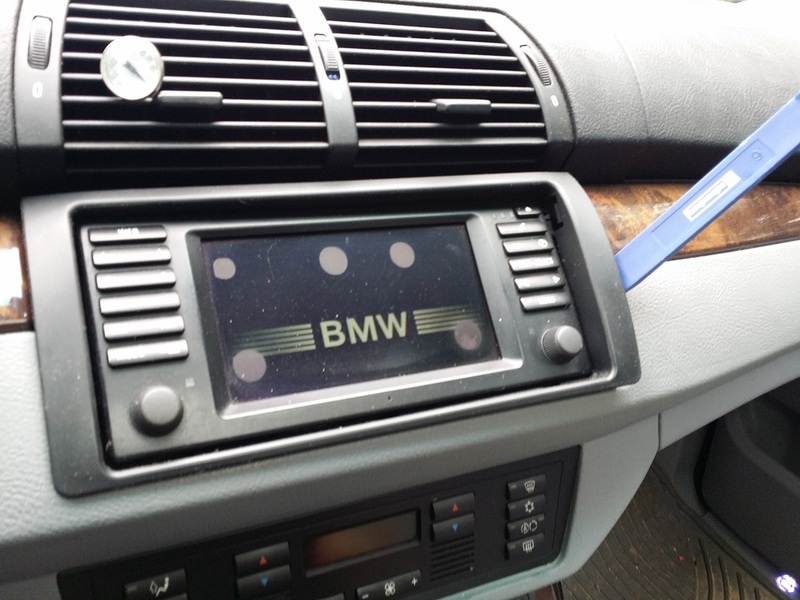 Congrats you now have a working aftermarket radio. Some shots of it running. 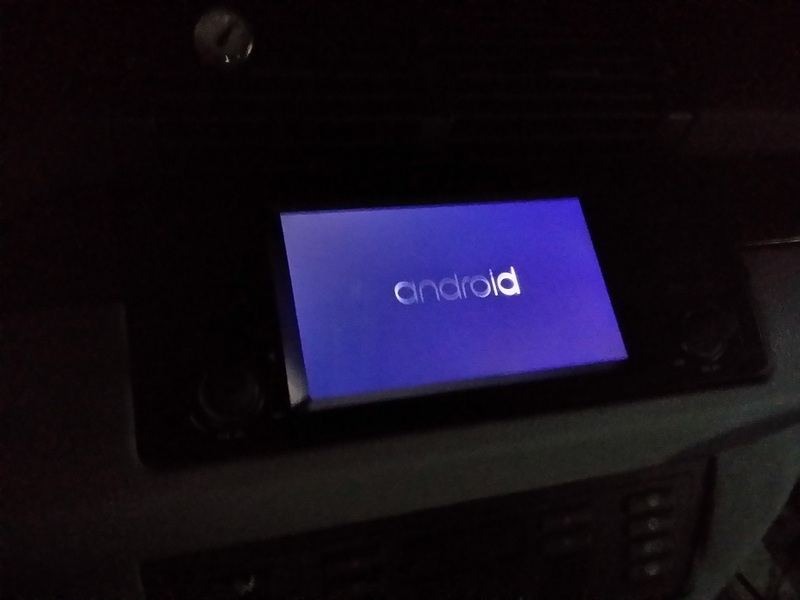 This concludes the installation of the head unit/radio itself. 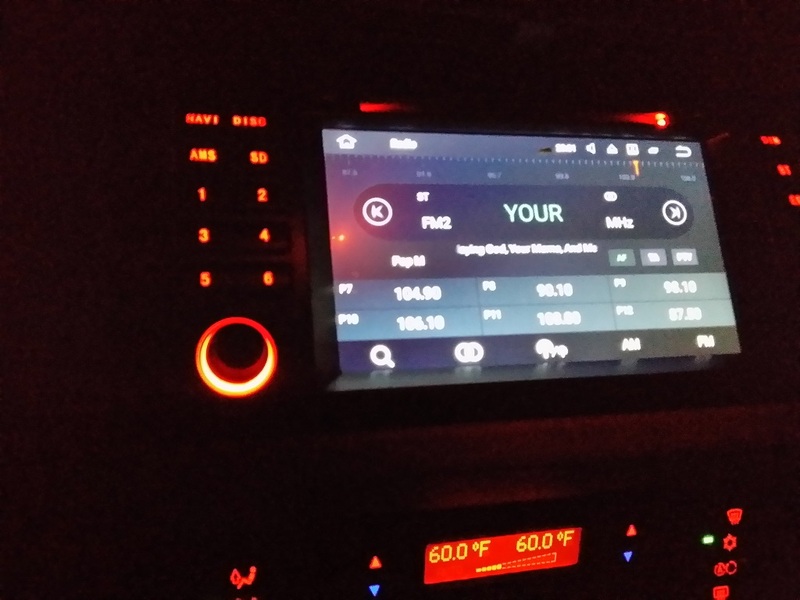 Choose the buttons below to go to the install sections for the components I have added to the radio such as the tv module, backup camera, etc. So to sum it all up here is what I bought, what I spent and where I got it. Bought this directly from Seicane’s site. Click the model number to go to their site. As of 10-2-2017 it is on sale for $298. I am not happy with the backup cameras so far so I don’t want to link to something I don’t like. Seems dishonest. I bought the first camera from Seicane which doesn’t fit X5 E53’s at all. So that one is a no go. Next I bought one from amazon. It works but the field of view is to narrow. I will update this section when I find what I like.